About to be executed for murder, Yelena is offered an extraordinary reprieve. She’ll eat the best meals, have rooms in the palace- and risk assassination by anyone trying to kill the Commander of Ixia. And so Yelena chooses to become a food taster. But the chief of security, leaving nothing to chance, deliberately feeds her Butterfly’s Dusté and only by appearing for her daily antidote will she delay an agonizing death from the poison. As Yelena tries to escape her new dilemma, disasters keep mounting. Rebels plot to seize Ixia and Yelena develops magical powers she can’t control. Her life is threatened again and choices must be made. But this time the outcomes aren’t so clear. From #1 New York Times bestselling author Marie Lu—when a game called Warcross takes the world by storm, one girl hacks her way into its dangerous depths. For the millions who log in every day, Warcross isn’t just a game—it’s a way of life. The obsession started ten years ago and its fan base now spans the globe, some eager to escape from reality and others hoping to make a profit. Struggling to make ends meet, teenage hacker Emika Chen works as a bounty hunter, tracking down Warcross players who bet on the game illegally. But the bounty-hunting world is a competitive one, and survival has not been easy. To make some quick cash, Emika takes a risk and hacks into the opening game of the international Warcross Championships—only to accidentally glitch herself into the action and become an overnight sensation. In this sci-fi thriller, #1 New York Times bestselling author Marie Lu conjures an immersive, exhilarating world where choosing who to trust may be the biggest gamble of all. I received this book from NetGalley in exchange for an honest review. All thoughts are my own. 4/5 ⭐️ This book releases April 16th. This story was richly dark and everything I didn’t realize I wanted. Uck, so atmospheric!! Please pick this book up if you love Poe as much as I do. It was so interesting and cool to read. Cat Winters weaves myth and reality together so expertly! Neil Josten is the newest addition to the Palmetto State University Exy team. He’s short, he’s fast, he’s got a ton of potential — and he’s the runaway son of the murderous crime lord known as The Butcher. Signing a contract with the PSU Foxes is the last thing a guy like Neil should do. The team is high profile and he doesn’t need sports crews broadcasting pictures of his face around the nation. His lies will hold up only so long under this kind of scrutiny and the truth will get him killed. But Neil’s not the only one with secrets on the team. One of Neil’s new teammates is a friend from his old life, and Neil can’t walk away from him a second time. Neil has survived the last eight years by running. Maybe he’s finally found someone and something worth fighting for. This is a gush about the series as a whole. I picked it up thinking it was an MM romance from the start. BOY was I wrong! It’s a slow burn hurt-comfort series that pays off big time in the last book. You’ll root for all of the characters by the end. I absolutely devoured this series in 3 days and can’t stop thinking about it. It was delectable! I think Andrew is my favorite character since he is so complex and interesting. The issues with Neil though just !! I can’t begin to tell you without spoilers. His growth was amazing. 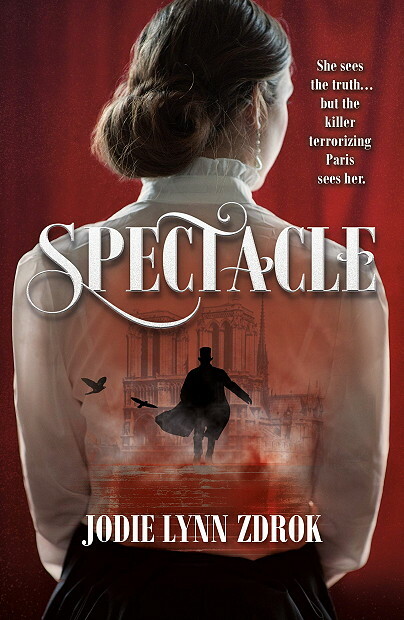 A YA murder mystery in which a young reporter must use her supernatural visions to help track down a killer targeting the young women of Paris. Sixteen-year-old Nathalie Baudin writes the daily morgue column for Le Petit Journal. Her job is to summarize each day’s new arrivals, a task she finds both fascinating and routine. That is, until the day she has a vision of the newest body, a young woman, being murdered–from the perspective of the murderer himself. When the body of another woman is retrieved from the Seine days later, Paris begins to buzz with rumors that this victim may not be the last. Nathalie’s search for answers sends her down a long, twisty road involving her mentally ill aunt, a brilliant but deluded scientist, and eventually into the Parisian Catacombs. As the killer continues to haunt the streets of Paris, it becomes clear that Nathalie’s strange new ability may make her the only one who can discover the killer’s identity–and she’ll have to do it before she becomes a target herself. For fans of Stalking Jack the Ripper! Nathalie was an interesting character to read about especially with her trying to navigate her world with her new ability. The writing was very good and the story was interesting. However, I didn’t like the ending and that’s why my rating got bumped down. Jodie Lynn Zdrok holds two MAs in European History (Providence College, Brown University) and an MBA (Clark University). In addition to being an author, she’s a marketing professional, a freelancer, and an unapologetic Boston sports fan. She enjoys traveling, being a foodie, doing sprint triathlons, and enabling cats. She is represented by Ginger Clark of Curtis Brown, Ltd. Giveaway is open to International readers. Must be 13+ to enter! 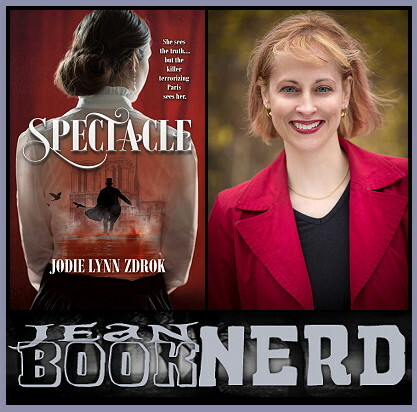 5 winners will receive a copy of SPECTACLE by Jodie Lynn Zdork! I am an Influencer for Belle and you can use my code DREAM12 to save 💜 Doing so will get me points towards getting a rep sleeve! I did pay for this sleeve shown here myself to do this review. Regardless, all thoughts are my own! Most days, Andrea doesn’t know whether she wants to kiss Tanner or punch him in the gut. He is seriously hot, with legit bedroom eyes and that firefighter body of his, but he’s a major player, and they can’t get along for more than a handful of minutes. Until now. Tanner knows he and Andrea have had an epic love/hate relationship for as long as he can remember, but he wants more love than hate from her. He wants her. Now. Tomorrow. But the more he gets to know her, the more it becomes obvious that Andrea has a problem. She’s teetering on the edge, and every time he tries to catch her, she slips through his fingers. Andrea’s life is spiraling out of control, and it doesn’t matter that Tanner wants to save her, because when everything falls apart and she’s speeding toward rock-bottom, only she can save herself. I received a copy of this from NetGalley in exchange for an honest review. All thoughts are my own. The Prince and the Pauper gets a modern makeover in this adorable, witty, and heartwarming young adult novel set in the Geekerella universe by national bestselling author Ashley Poston. Imogen Lovelace is an ordinary fangirl on an impossible mission: save her favorite character, Princess Amara, from being killed off from her favorite franchise, Starfield. The problem is, Jessica Stone—the actress who plays Princess Amara—wants nothing more than to leave the intense scrutiny of the fandom behind. If this year’s ExcelsiCon isn’t her last, she’ll consider her career derailed. When a case of mistaken identity throws look-a-likes Imogen and Jess together, they quickly become enemies. But when the script for the Starfield sequel leaks, and all signs point to Jess, she and Imogen must trade places to find the person responsible. That’s easier said than done when the girls step into each other’s shoes and discover new romantic possibilities, as well as the other side of intense fandom. As these “princesses” race to find the script-leaker, they must rescue themselves from their own expectations, and redefine what it means to live happily ever after. 5/5 ⭐️ This book releases on April 2nd 2019! Hey everyone! I haven’t done a chatty post in a while so I figured I’d pop on and share some recent reader struggles.